At long last, the VM O-ring kit is available! This kit is designed for the Mikuni VM carburetors that were fitted to 1977-1979 Suzuki four-cylinder engines. (It's probable that there are Kawasaki fours that use the same carbs, so these should fit your bikes as well. I guarantee nothing.) There's a rebuild procedure for these carbs here: by Paul Musser at the GS Resources. Since each part has about 14 different names, varying with who you talk to, I simplified things and just used A-F.
Part 'D' is the bowl drain plug. Part 'E' is the choke plunger assembly. 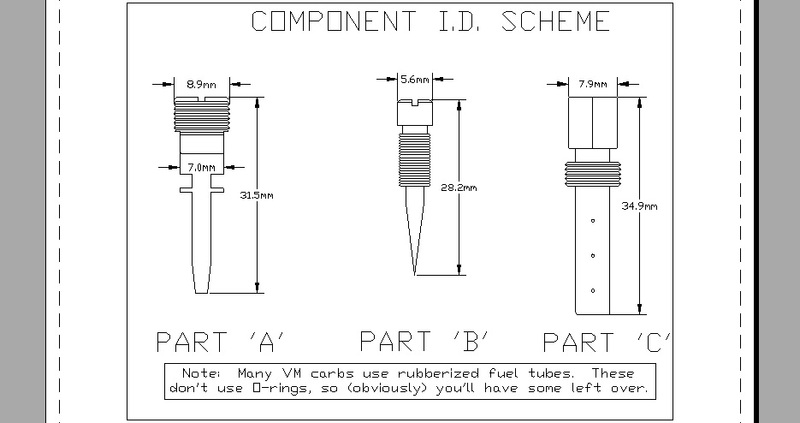 Part 'F' fits the fuel tubes; some VM carbs use 12 of these, some use 8, and some don't use any at all. I include 12 in every kit because I have no way of knowing if someone swapped carbs on your bike. Having leftovers beats being shorted. The smaller O-rings are substantially fatter. If you have too much OR too little material in the ringland, you are headed for problems. For a while, this was a very common source of trouble for people on the GS Resources website. It's common to drain fuel from the bowls by removing the drain plugs. This disturbs ancient O-rings, which now leak. Replacements with the right I.D. (or reasonably close) are available from generic kits; most auto part stores can find a 'match' in what are known as "Dash Size assortments". The problem is, the dash size for that I.D. is far too fat. In direct comparison, it looks pregnant. You have to really crank on the screwdriver to tighten that drain plug now! Guess what's happening. The odds are overwhelming that you'll find slivers of sheared-off O-ring in the fuel bowl. Guess where those slivers wind up. You'd be pulling the carbs again very soon. To order this kit, proceed to the order page. Before you do anything rash, though, you should look over page 3 (Intake stuff).